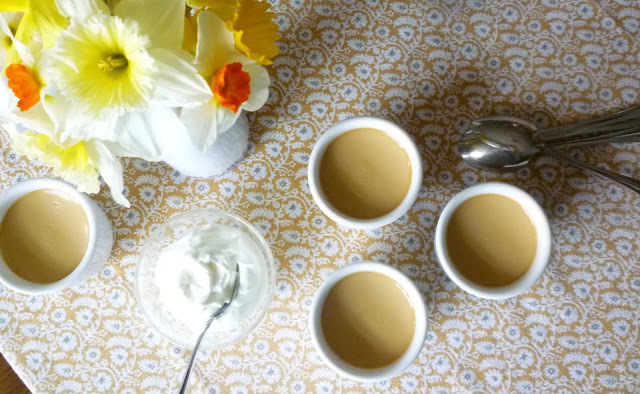 This week I taught one of my favorite classes: Classic Home-Style Desserts. The class is filled with recipes that are reminiscent of the kinds of desserts my mother made when I was growing up: Pineapple Upside-Down Cake, Spicy Gingerbread, Soft Jam-filled Sugar Cookies and Coconut Cream Tart). I admit that they are not exactly like what she would have made...the chef in me couldn't resist tweaking them a bit.... I use fresh pineapple in the upside-down cake...and Lyle's Golden Syrup in the gingerbread. The coconut filling for the tart is a fluffy Bavarian cream. But even with these changes, they all still have a very familiar feel about them. The fifth recipe in the class—Butterscotch Pot de Crème—is very much in keeping with this "familiar but fresh" theme. 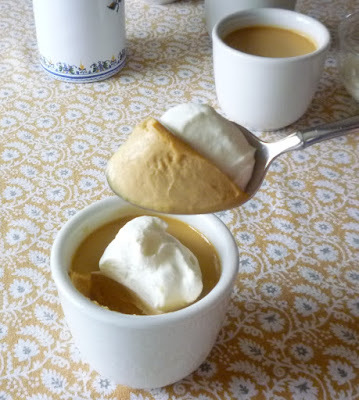 Soft creamy puddings...and baked custards....were a staple at our house, and butterscotch was one of my mother's favorite flavors. 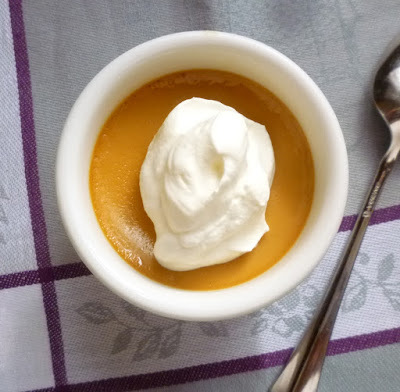 But for my class, instead of a simple pudding or plain baked custard, I decided I wanted to make the more grown-up pot de crème...that egg yolk- and cream-rich baked custard par excellence from France. I have waited to post this particular recipe, even though I have been teaching this class for several years, because I have continued to tinker with the recipe each time I have taught the class. But I think my tinkering and tweaking is done at last...I finally have it right where I want it. Lest anyone think I have been teaching a substandard recipe in the past, I would like to assure you that I have not. The original recipe is from one of my all time favorite cookbooks (The Vineyard Kitchen, by Maria Helm Sinskey)...and it really is delicious just as originally written. The small changes I have made are more about my own personal tastes. 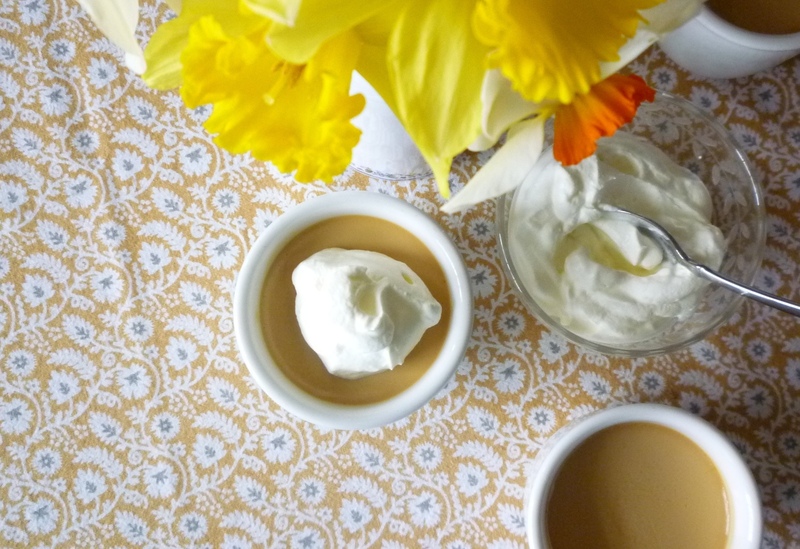 To begin with, even though pot de crème is supposed to be rich with cream, the original recipe had a much higher proportion of heavy cream than I like. To correct this I doubled the quantity of milk and reduced the cream by a quarter. In so doing I was able to reduce the butterfat richness of the custards (which can sometimes produce what I consider to be an unpleasant tongue-coating texture) without altering the ratio of combined milk and cream to egg yolks. The finished custard is still quite rich...but not overwhelmingly so. The old-fashioned butterscotch flavor of the custards is achieved with brown sugar and a small amount of caramelized granulated sugar. The caramelized sugar is one of the things I particularly liked about the original recipe. It gives a sharp caramel undertone to the flavor that is missing in an ordinary brown sugar-sweetened butterscotch pudding. But since the caramelization process reduces the perceived sweetness of sugar by about fifty percent—and I wanted my custards to be just a bit sweeter (a quarter cup of sugar per cup of milk/cream is about right)—I doubled the amount of granulated sugar called for in the original recipe. This brought the sweetness right up to where I like it. Finally, I added a small amount of salt and vanilla. I think at this point almost everyone knows that salt enhances the flavor of caramel. Adding a pinch seemed like an obvious adjustment to make...a small amount really does do the trick. And just like the salt, vanilla does a great job of bringing out the butter-y caramel-y taste one is looking for in something called butterscotch. Its addition too seemed like a no-brainer, too. If it happens that you are reading this post and you have never experienced pot de crème, this recipe would be a great place to start. But you also might want to try the recipe for chocolate pot de crème that I posted a few years ago. In that post, I go into more detail about the origins and basics of this exceptional baked French custard. You also might want to check out my recipe for pumpkin pot de crème. 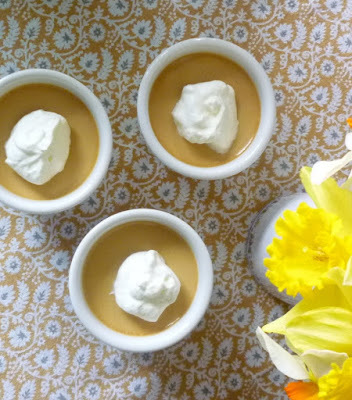 No matter which one you start with, I imagine you will be so enamored that you will want to make sure that pot de crème becomes a part of your regular repertoire of comforting, homemade desserts. Preheat the oven to 325°. Line a roasting pan with a kitchen towel and place ramekins or custard cups in the pan (see note). Set aside. Place the milk and cream in a saucepan and heat until steaming. Remove from the heat and cover to keep warm. Place 1/3 c. sugar in a heavy, large saucepan and set over medium-high heat. When the sugar begins to melt, stir with a wooden spoon. 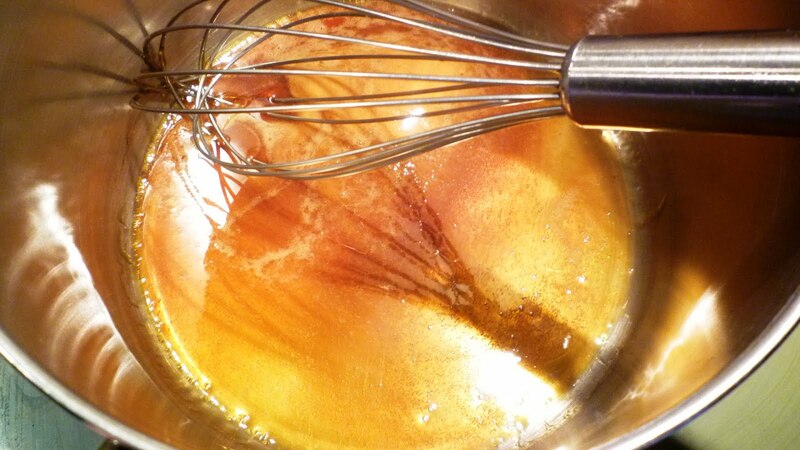 Continue to stir and cook until all the lumps of sugar are dissolved and the sugar syrup is a light amber color—this will only take a minute or two. Remove the pan from the heat and slowly stir in the hot cream-milk, stirring constantly as you do so—be careful, the hot caramel will sputter. Set the pan back on the heat and stir until the caramel is dissolved. In a large bowl, lightly whisk the brown sugar into the eggs and vanilla. Return the cream to the heat and bring back to the boil. Gradually add the hot liquid to the egg mixture, whisking constantly. Pour the custard through a fine mesh strainer. Allow to sit for a minute or 2. Skim and discard the foam that has risen to the top. Divide the custard among the ramekins. Pour enough boiling water into the roasting pans to come half way up the side of each ramekin. Cover the pan loosely with aluminum foil or a flat piece of parchment—this prevents a hard skin from forming on the custards while they bake. Bake in the center of the preheated oven until the custards are set around the edges but still trembling in the center—30 to 40 minutes. Remove the ramekins from the water bath and allow them to cool to room temperature. Cover and chill for at least 8 hours before serving. Traditionally this recipe would use 8 egg yolks. But often I find that my yolks are a bit under-sized...so, I began adding in the white of the last egg. A bonus of this is that the custards have a slightly softer set. You may use any size ramekin/custard cup that you like. If you use 4 oz. cups you will get 10 portions. If you use 6 oz. cups, you will get 7 portions. Paige, I made these for a dinner party yesterday evening, and they were a bit hit. I'm so pleased to hear this! Thank you for taking the time to let me know.